Each post in our Life Science Marketing Plan series will help you piece together a ‘map’ that is representative of the analyses and learning process that will help you define your marketing strategies and tactics for the year. In the first part of this series, we provided and outline and described why marketing plans are needed for life science companies of all sizes to meet their goals. In this post, we’ll define the first half of the components in detail. Let’s get started! Executive Summary. Even though this part of the marketing plan is at the beginning, it is written at the end. Writing a marketing plan is like a journey, and at the end of it you will have learned a lot and have a clear understanding of the strategies and tactics needed to help you reach your goals. Keep in mind that several people, especially senior management, will read only this part of your marketing plan, so summarize the report here and don’t worry about being a bit redundant. Feel free to reference figures and tables in the report for easy and quick analysis. Also, if there’s a point you’d like to make to senior management (e.g., I need a bigger marketing budget to meet my numbers!) this is a good place to make your case. Situational Analysis. Before getting started on an in-depth analysis, you need to provide details about your products, internal factors, and external trends which will help explain where you’re starting from. Remember that the marketing plan is a tool to help you communicate to others, so this is a good place to step back and set the stage so that anyone in your company who reads the plan will understand it clearly. Be very literal and don’t worry about explaining things you think everyone knows, such as defining the products included in the marketing plan and that big acquisition that occurred 3 months ago (a safe bet you’ll need to include that these days). In this section you will describe broader issues such as the life cycle stage of your products and any history that is relevant such as trends in the industry and current attitudes about your company’s brand. Sales History and Forecast. This is fairly self-explanatory, but sometimes a bit tricky depending on when you are writing your plan. Because you normally need to start your plan well before the year ends, having a full year of sales history is difficult. In my experience, projections are normally used to estimate sales for the current year, and remember that sales fluctuate from month to month (e.g., December is usually lower) so base the remaining months’ sales based on these changes. Sales forecasts for the year that the marketing plan describes may need to be done at the end of the report, as the complete analysis may be needed to make predictions. Consideration of the historical sales growth, the size of the marketing budget in comparison to yearly revenue, and other factors will be important. In addition, my experience has been that ‘top down’ forecasts are sometimes given to marketing and product managers, indicating the revenue growth they must achieve in the coming year. While this is sometimes disheartening, the marketing plan can be used to explain why a higher budget is needed if these growth figures are too ambitious. A general rule of thumb is that the marketing budget should be at least 10% of the annual sales for the products it supports. In practice, I’ve seen the budgets run much lower than this, perhaps because marketing is sometimes under-appreciated in life science companies. However, it’s a good number to shoot for, and a strong marketing plan will provide confidence to the management that you will meet your goals if given the appropriate budget (and be prepared to work hard to reach them if your wishes are granted!). Market Research. One of the objectives of a marketing plan is to ensure that your company continues to be driven by the market. In other words, you need to know about your customers’ needs and about factors that are driving their purchases, and there is no substitute for getting this information straight from them. 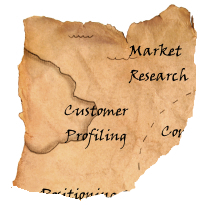 Market research can be done many ways–you can buy off-the-shelf reports (Price $3-10K), hire a company (broad price range, $5K minimally), or conduct research yourself (price varies greatly). The scale can be large or small, from online surveys of hundreds to phone interviews of 10. Larger and purchased surveys will give you estimates on the size and growth of the market and each company’s share of it, while smaller surveys help you understand your customers more on a personal level (which is very important as we’ve discussed). Another consideration is whether you want the survey to be blind, and whether it should focus on only your customers or more broadly. One of my fantastic mentors Michael Gonzales told me once at the start of a market research project to define very specifically what internal decisions you need to address before you begin, and write each question to definitively provide answers to them. There is no point in posing a question unless it will have an unambiguous effect on a decision that you will make. It is easy to get carried away designing questions related to your company or products, as you’re curious about so many aspects, but keeping your objectives clear helps to focus the effort. Questions should center around the customers’ needs and habits and how they relate to your product development and tactics. What are their daily struggles or ‘pains’ in the broad area of your products? What conferences are they attending this year, and which publications do they read? Perhaps most importantly, you should give customers a chance to give you any feedback they have for you in an open-ended format, as they’ll often have great ideas and opinions and appreciate being heard. Even with a focused effort, you’ll learn a lot about your customers and their needs, and can use the information all year for many different purposes. After you’ve completed these tasks, you’re well on your way towards completing your ‘journey’ towards defining your marketing strategy and tactics. The way the pieces fit together will become even more clear after the next post in our series, The Life Science Marketing Plan, Part 3: Components (Second Half). Sign up for updates so you won’t miss anything, and see the whole series here.